Browse our huge selection of commercial square picnic tables. 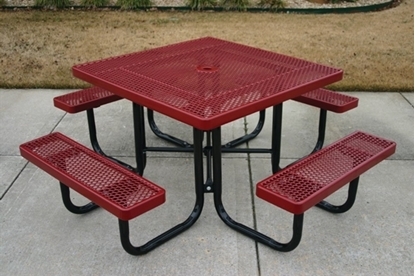 We offer commercial square picnic tables made of metal, wood, or concrete with all the best prices. 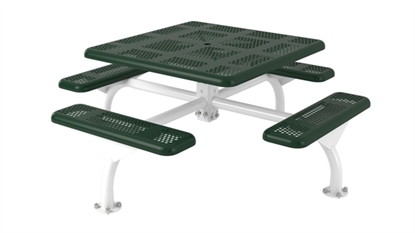 ELITE Series Nexus 46" Square Thermoplastic Metal Picnic Table with 4 Attached Benches, Surface or Inground Mount, 337 lbs. 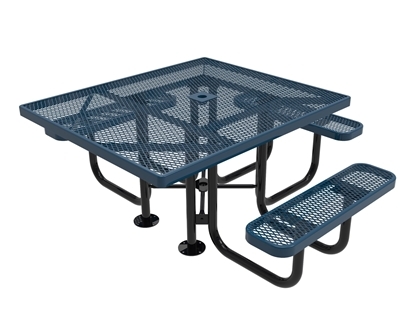 ELITE Series ADA Nexus 46" Square Thermoplastic Metal Picnic Table with 3 or 2 Attached Benches, Surface or Inground Mount, 337 lbs. 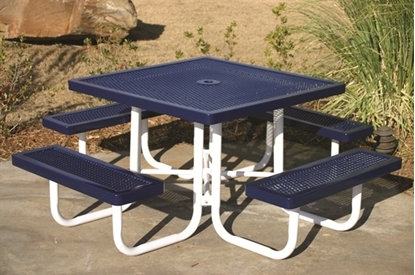 ELITE Series ADA 46" Square Thermoplastic Metal Picnic Table, 3 Seats, Portable or Surface Mount, 217 lbs. ELITE Series Square Thermoplastic Metal Picnic Table, Portable, 223 lbs. 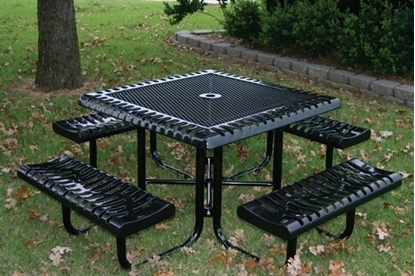 Square Thermoplastic Steel Picnic Table, Ultra Leisure Style, Seats 8, 296 lbs. 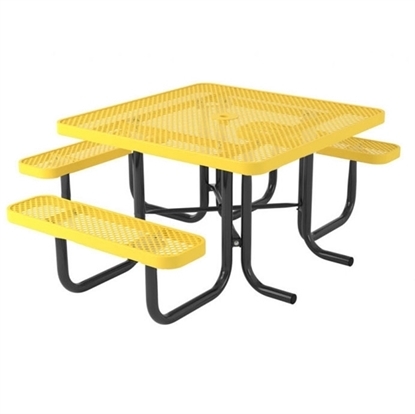 Square Thermoplastic Steel Picnic Table, Perforated Style Seats 8 adults, 334 lbs. 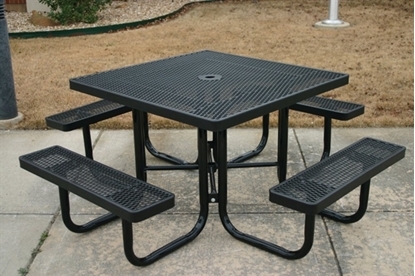 Square Thermoplastic Steel Picnic Table, Regal Style Seats 6 On Benches and 1 Wheelchair, 361 lbs. Square Thermoplastic Steel Picnic Table, Classic Style, Seats 8 Adults, 290 lbs. 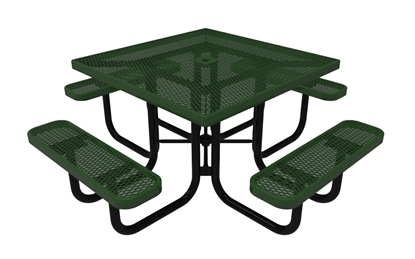 Quick Ship Square Thermoplastic Steel Picnic Table with Three Attached Seats, Ultra Leisure Style, 233 lbs. 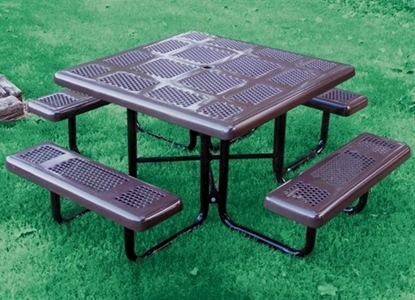 Wheelchair Access Square Thermoplastic Steel Picnic Table, UltraLeisure Style Seats 6 Adults and Wheelchair, 176 lbs. 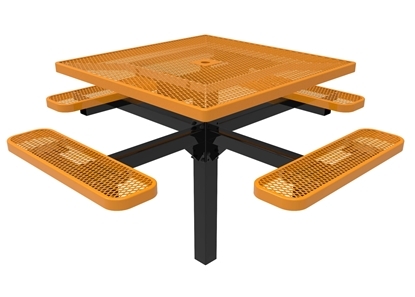 Square Picnic Table 46 inch Thermoplastic Coated Perforated with Powder Coated Steel Tube, Portable / Surface Mount, 315 lbs. 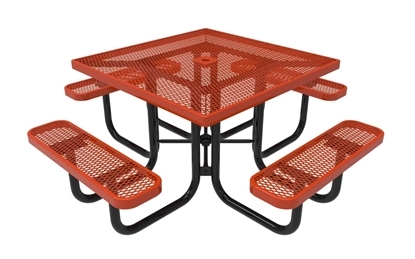 Quick Ship Square Thermoplastic Steel Picnic Table, Wheelchair Accessible with 3 Seats, Ultra Leisure Perforated Style, 228 lbs. 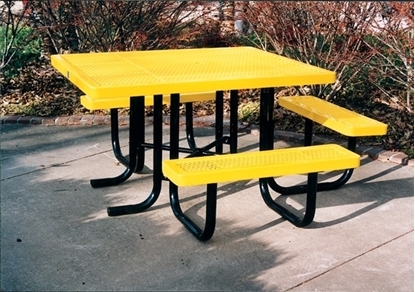 ADA Compliant Quick Ship Square Thermoplastic Steel Picnic Table with Three Attached Seats, Ultra Leisure Style, 233 lbs. 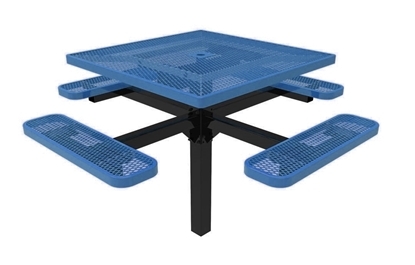 Quick Ship ADA Compliant Square Thermoplastic Steel Picnic Table, Wheelchair Accessible with 3 Seats, Ultra Leisure Perforated Style, 305 lbs. 46" Square Thermoplastic Steel Picnic Table, Regal Style Seats 8 Adults, 253 lbs. ADA Compliant Wheel Chair Access Square Thermoplastic Picnic Table, Regal Style, 233 lbs. Square picnic tables offer seating for eight people comfortably. ADA Wheelchair accessible tables use one side to provide wheelchair accessibility. Food Courts take advantage of the uniform shape to increase the seating capacity and easy social interaction of opposing seating. Schools enjoy the benefits of square picnic tables for projects and canteen seating.